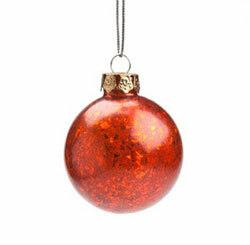 Give the gift of a lasting keepsake with one of our many glass Christmas Ornaments! Whether you're adding to a themed tree, going for a certain color combination, or giving a gift, we're sure to have something for everyone! We carry a growing variety of glass ornaments by Raz Imports, Cody Foster, Primitives by Kathy, Ragon House, One Hundred 80 Degrees, and more! 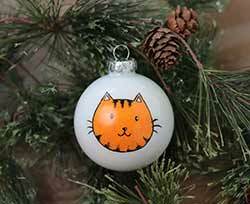 See also our collection of hand painted, custom, personalized glass ball ornaments. Painted to order, and gift boxed, ready for giving! Contact us soon to put your ideas in action, to ensure completion before Christmas! 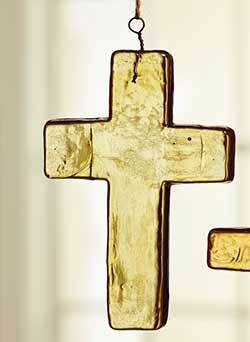 Made of textured pressed glass in an amber color, this is for the cross ornament in the Large size. 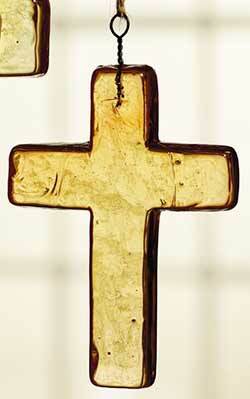 Made of textured pressed glass in an amber color, this is for the cross ornament in the Medium size. 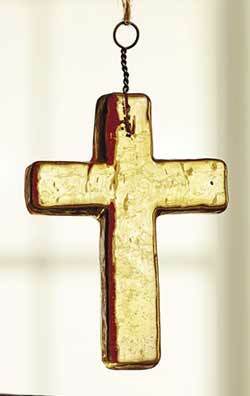 Made of textured pressed glass in an amber color, this is for the cross ornament in the Small size. Antiqued Acorn Cluster Ornament, by Raz. 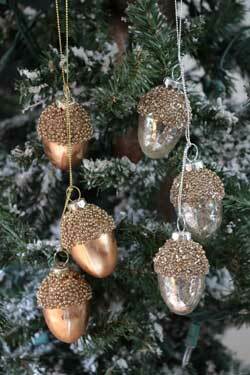 Cluster of three glass acorns with beaded accents clustered together. Sold individually - Choose the Gold (Left) or the Silver (Right) Ornament. Part of the Pheasant Collection. Measures 4 inches (acorns are 2 inches). Made of glass. 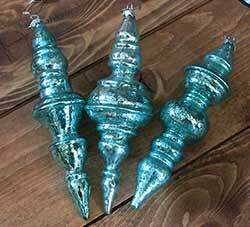 Aqua blue mercury glass acorn ornament with antiqued mottled finish and beaded top. Part of the Telluride Sleigh Ride Collection. 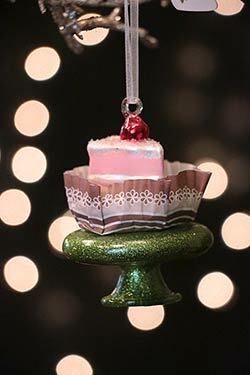 Pink Antiqued Finial Ornament, by Raz Imports. 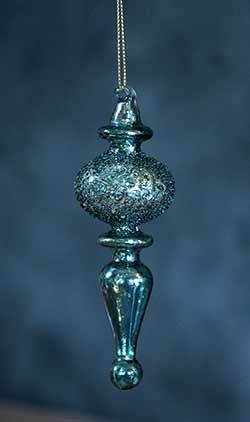 Beautiful glass finial ornament with mercury-like antiqued finish, with glittered details. This one is a soft pink. Measures approx 5 inches. Part of the Champagne Frost Collection. 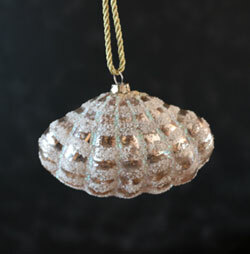 Silver Antiqued Finial Ornament, by Raz Imports. 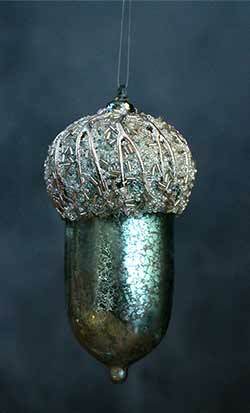 Beautiful glass finial ornament with mercury-like antiqued finish, with glittered details. This one is a warm silver. Measures approx 5 inches. Part of the Champagne Frost Collection. 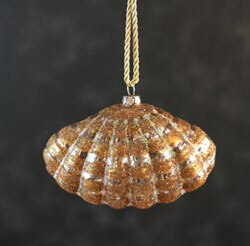 Antiqued Gold Finial Ornament, by Raz Imports. 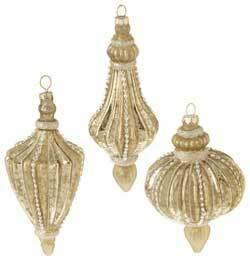 Gold glass finial ornament with mercury-like antiqued finish, with beaded details. Sold individually - Choose the left, middle, or right ornament. Measures 6.5 / 6 / 5 inches. Part of the Champagne Frost Collection. 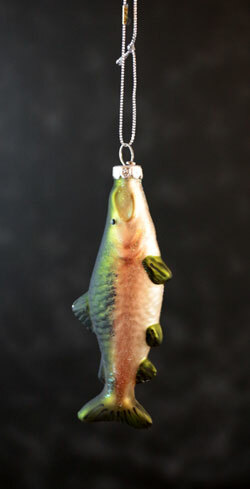 Antiqued Silver Beaded Glass Ornament, by Raz Imports. 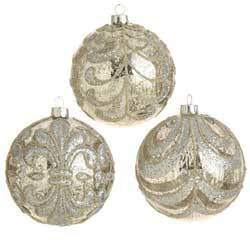 Silver glass ball ornament with mercury glass-like antiqued finish, with designs in microbeads. Sold individually - Choose the left, middle, or right ornament. Measures 4 inches. Part of the Champagne Frost Collection. Antiqued Two Tone Christmas Ornaments, by One Hundred 80 Degrees. 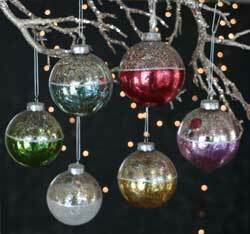 Glass ball ornaments with an antiqued mercury-glass-like finish. This version is two toned, with silver on the top and colored on the bottom. 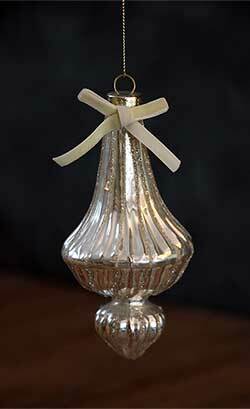 Glass finial ornament with an antiqued mercury-glass-like finish. Sold individually (priced per finial). Aqua Blue Onion Shaped Glass Ornament, by Raz Imports. 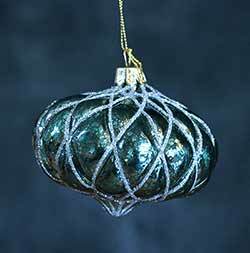 Antiqued, mercury-style glass ornament in a pretty aqua blue, criss-crossed with silver glitter. Measures approx 3 inches. Made of glass. Beautiful on a winter-inspired tree! Ballet Shoe Ornament, by the Abbott Collection. Sweet pink ballet shoes, a perfect keepsake gift for that ballerina in your life! Measures 3 inches. 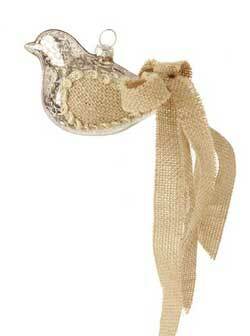 Bella Boutique Bird Ornament, by Giftcraft. Part of the Bella Boutique Collection, this opaque glass ornament is adorned with exquisite images of winter and Christmas themes. Light glows beautifully through the glass, illuminating the art! This is for the BIRD ornament (MIDDLE in photo). Reads "Have yourself a merry little Christmas." Measures 3.5 x 9 inches. Bella Boutique Santa Ornament, by Giftcraft. Part of the Bella Boutique Collection, this opaque glass ornament is adorned with exquisite images of winter and Christmas themes. Light glows beautifully through the glass, illuminating the art! This is for the SANTA ornament (LEFT in photo). Measures 3.5 x 9 inches. Bella Boutique Stag Ornament, by Giftcraft. Part of the Bella Boutique Collection, this opaque glass ornament is adorned with exquisite images of winter and Christmas themes. Light glows beautifully through the glass, illuminating the art! This is for the STAG ornament (RIGHT in photo). Measures 3.5 x 9 inches. 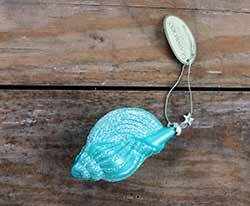 Aqua blue glass finial-shaped ornament with beaded detailing. Sold individually from four slightly different shapes. Part of the Telluride Sleigh Ride Collection. 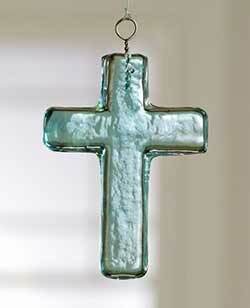 Made of textured pressed glass in a light blue color, this is for the cross ornament in the Large size. 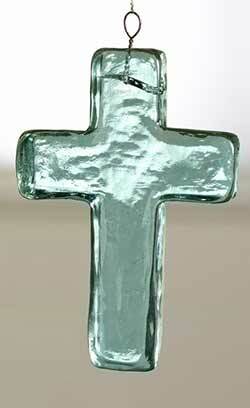 Made of textured pressed glass in a light blue color, this is for the cross ornament in the Medium size. 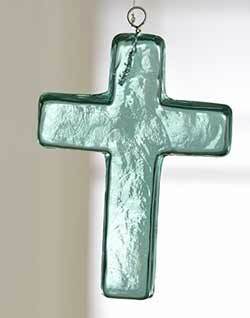 Made of textured pressed glass in a light blue color, this is for the cross ornament in the Small size. Broken Glass Ornament, by Ragon House Collection. 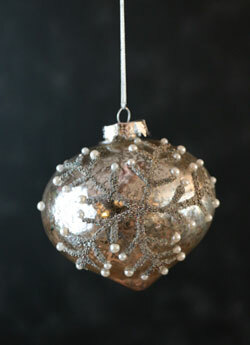 Unique style of ball ornament - smooth mercury glass-like finish on the side, while the inside is lined with broken shards of glittering glass. This is for the light Blue ornament. Measures 2 inches. Other colors available! 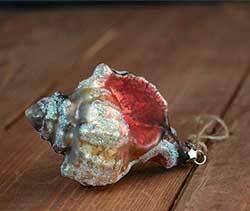 Broken Glass Ornament, by Ragon House Collection. 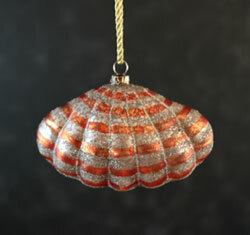 Unique style of ball ornament - smooth mercury glass-like finish on the side, while the inside is lined with broken shards of glittering glass. This is for the light Green ornament. Measures 2 inches. Other colors available! 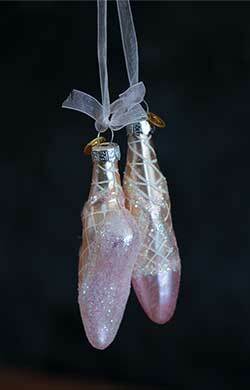 Broken Glass Ornament, by Ragon House Collection. Unique style of ball ornament - smooth mercury glass-like finish on the side, while the inside is lined with broken shards of glittering glass. 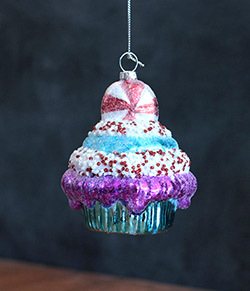 This is for the Pink ornament. Measures 2 inches. Other colors available! Broken Glass Ornament, by Ragon House Collection. 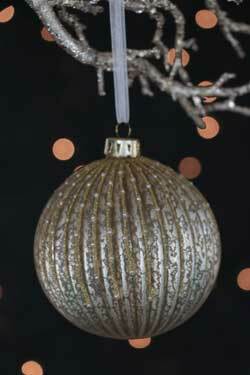 Unique style of ball ornament - smooth mercury glass-like finish on the side, while the inside is lined with broken shards of glittering glass. This is for the Red ornament. Measures 2 inches. Other colors available! 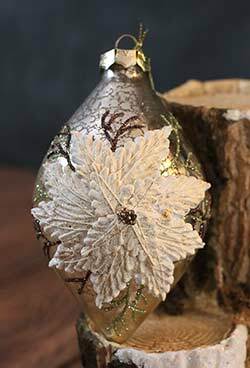 Antiqued, mercury-style glass ornament accented with a cream-colored dimensional poinsettia flower design, and vines of green and brown glitter. This is for the DROP Ornament. 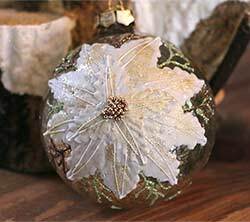 Antiqued, mercury-style glass ornament accented with a cream-colored dimensional poinsettia flower design, and vines of green and brown glitter. 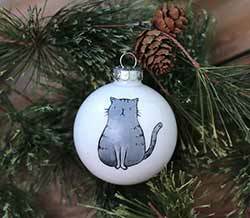 This is for the BALL Ornament. Beautiful glass bowl with fluted surface, in an elegant champagne color with mottled, mercury-glass like finish. Studded with tiny pearls.